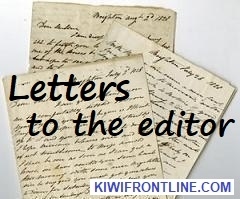 Feel free to share letters from this site, but accreditation to kiwifrontline.com would be appreciated. That way, our voices and concerns will grow stronger. Everybody — visitors, residents and Kiwi citizens — can reasonably expect to be safe and free from harm and danger in New Zealand. However, political wallowing, wailing and bleating doublespeak does nothing for Kiwis' psyche, only alienating many people with inane suggestions being floated. Certainly we must try to ensure Christchurch-type catastrophe never happens again by taking appropriate practical steps, but we must move on from agonising over Christchurch ad nauseum. As a first step, gun control/ ban was essential, but why didn't we just follow the Australian legislation with amendments, although whereas they had a firearm registry, we in New Zealand have not since 1987? Blame our politicians for this, and for allowing free access to military-style semi-automatic weapons etc. It is all very well getting compliance from legitimate gun owners, but what about the tens of thousands of illegal guns floating about in Etherland, and what will politicians do to track down those weapons? What will the government do with all the guns purchased for between $100 million and $300 million? It has been rumoured that they may look to sell some guns overseas, where they could end up in conflict zones in Africa and the Middle East. Can the government categorically state this will not happen, and that all the guns surrendered will be destroyed? Where is the urgent critical workable gun register legislation? A Supreme Court judge has been appointed to head the Royal Commission (costing $8.4 million), which will go on forever, yet no firm conclusions are anticipated. Wouldn't it have been better to get the terrorist trial out of the way, where much of the evidence etc, may be forthcoming anyway? Appallingly, what continues to happen is the usual culprits' exploitation of the Christchurch massacre by seizing every opportunity to heap vitriolic, scurrilous attacks amounting to hate speech on their fellow Kiwis in an attempt to shut down robust criticism of their own offensive activities. Justice Minister Little is looking at new hate speech legislation, presumably to shield the government, local government and the race-based activist ratbags from robust criticism by trashing the right to freedom of speech. New Zealand sports team names that were never an issue until this evil lone wolf terrorist surfaced in Christchurch have now also come under the blowtorch. Frankly, how can anyone have any confidence in any government legislation or policy initiatives when it can't even get the Provincial Growth Fund fiasco, Kiwibuild debacle or Cullen's crazy CGT issues sorted? These socialist sods who are imbued with the global world socialist (Marxist) philosophy, which always over-promises and under-delivers, being based on the philosophy of failure, ignorance and arrogance, with the equal sharing of miseries by everyone, couldn't organise a booze-up in a brewery, while their rivals, who pay lip service to capitalism, the philosophy of greed resulting in the inequitable, disproportionate sharing of wealth, are no better. Both factions share many of the same despicable traits, including the lack of public consultation, transparency, openness, honesty or accountability. Trust any of them at your peril. The non-Maori 85 per cent of the population, commonly referred to in the media as the Silent Majority, should more aptly be called the Pathetic Apathetics. Their only contribution to the running of the country is to put some marks on the electoral voting papers every three years. Tauranga In response to Mr Dey, (Letters, April 4), in my view, the purpose of local government is (among other things) to promote the social economic environmental and cultural wellbeing of communities in the present and for the future. TCC is not in itself obliged to gift back purchased land to the vendor and then pay a rental. The Elms continues to promote the cultural history of all New Zealanders and is one of the oldest heritage sites in New Zealand. The people of New Zealand have paid hugely in terms of legislated goodwill. The various statutes have rigorous provisions for Treaty implementation for which the nation is paying. This is not one of them. The council assisted in the purchase of the land for the future development of the Elms and also to prevent commercial ownership of adjoining land. Gifting the Lot in question immediately creates an opportunity for iwi to have both a commercial and governance interest. The peninsula was originally purchased by the Mission Society after it was abandoned by Maori after inter-tribal warfare. The Anglican Church has already gifted 14 acres of Te Papa (which it had purchased legally) to the winner. How much more goodwill do you want? The transfer of Lot 11 to anyone other than the Elms would be another transaction not in the interests of the ratepayers and the majority of the Bay of Plenty people. The potential Crusaders’ name change marks a victory for the Marxist Left, the pseudo-liberals, the Muslim jihadists and the historically illiterate revisionists. The ignorance of history, which is a major cause of this regression, should come as no surprise to the population, as both leading political parties have suppressed the nation’s history since the 1970s and exacerbated the situation by permitting dramatic revisions to our national statutes, even the Treaty, without any historical knowledge of them or consideration of future ramifications. This ignorance of our nation’s history is so prevalent that we have a prime minister, presently lauded internationally and with suggestions of a Nobel prize nomination, who did not know the wording of the Treaty of Waitangi. History records that the Muslim jihadists began invading Europe in the eighth century and their violent mission of converting all to Islam continues to this day. The Indigenous Freshwater Fish Amendment Bill (News, April 6) includes in definitions “Treaty settlement legislation”. Amongst other references to Maori it also gives priority in Section 48A (5) wherein any inconsistency in provisions in freshwater fish regulations or provisions relating to Maori fishing rights then Treaty legislation will prevail. The Bill seems, in my view, to be less of a fish protection proposal than an effort to entrench Maori/ Treaty control issues in the Conservation Act which has operated successfully for all New Zealanders through the auspices of the Fish and Game Council and the Conservation Department. There is also the reference in the proposed amendment that “these regulations or notices do not affect Maori fishing rights” and they can continue to harvest their whitebait etc. while controlling access under the guise of kaitiaki. I am wondering if, before taking this Bill into committee stages, any consideration was given to the report by Geoffrey Palmer which included concerns about the negative effect on Fish and Game. This is particularly relevant in the amendment (6) to Clause 7J. While the Treaty of Waitangi gave tangata Maori, “The same rights as the people of England if they gave up their kawanatanga/governments to the Queen”, it did not make New Zealand into a British Colony under one flag, one government and one law. After the Treaty was signed, New Zealand remained under Governor Sir George Gipps and the dependency and laws of New South Wales. On the 3rd May 1841, Queen Victoria’s Royal Charter/Letters Patent dated the 16 November 1840 separated New Zealand from New South Wales dependency and New Zealand became an independent British Colony. Not only did New Zealand became a British Colony on this day, but we were given our first Governor and Constitution that set up our political, legal and justice systems under one flag, one government and one law, irrespective of race, colour or creed. This document was, “Our true Founding Document and first Constitution”. As Maori celebrate the Treaty of Waitangi on the 6th February, all New Zealander’s must celebrate New Zealand’s Independence Day on the 3rd May every year. It is the day we became, One Nation under One flag, One government and One law! It’s time to shout it from the roof tops! Don’t let another year go by without celebrating. It’s only one month away. I note in your “Hot Topics” quiz that you state that English is one of the three official languages of New Zealand. You know this is incorrect because, for many years, a prolific letter writer on this very subject to your paper, the late Robin Bishop, had tried right up until her passing to get English accepted into law as an official language. She even presented her petition which I also signed to her local MP, Simon Bridges, for him to table in Parliament, but not surprisingly that disappeared into the ether, never to be seen again. Can I respectfully ask that before putting incorrect answers to your quizzes that you indeed research your subjects more thoroughly? SIMON Chapple’s article (ODT, 4.4.19) makes timely reading. The Begg brothers, doctors Neil and Charles, were noted historians last century. They passed on a lot about the history of contact. In a footnote to one of their books, they mentioned that the captain of the Endeavour (Tupai’s ship) had sired a child, in the Marlborough Sounds in 1769. She was sighted during the 1777 voyage — as an 8year old. The writers noted that the captain could have either been Joseph Banks, or Captain James Cook — they being the trading captain and the sailing captain respectively. It might be interesting to note that one gentleman would have passed on some immunity to the disease. These illnesses were passed on inadvertently during the period of contact. If James Cook had been the father, it is possible that his only descendents might be found among the population of New Zealand today. Perhaps the delay in the release of the last census figures is because they are trying to find more citizens with a trace of Maori blood. The Hastings District Council has voted to support and promote racism within its district. The Christchurch massacre was caused by racism, but, abhorrent as it was, the District of Hastings has voted to support those actions by practising its own form of racism. It has voted to appoint two Ma¯ ori to their four standing committees, ignoring democracy by circumventing the council’s requirement that only elected councillors be allowed to vote on these committees. This is against basic democracy within a democratic New Zealand. Race-based government is called an apartheid copy of South Africa. One that this country has opposed both politically and publicly. Heaven forbid that our own FNDC attempts the same sort of nonsense. I refuse to purchase fish, fruit, veges or wine from the Hastings area. Do not support racism. The calm, well-researched, reasoned article on multiculturalism by Jim Traue is in striking contrast to the emotive outbursts and pleas relating to racism and freedom of religion since the Christchurch murders. It is also highly relevant to Wellington City Council's pursuit of Maori biculturalism, evidenced by the reference to Tangaroa in a scientific, planning document. The inept handling of the matter, from the inclusion of the word in the first place, was shown by supporting councillors comments (April 5). The mayor associated use of Tangaroa with Father Christmas and the Easter Bunny, insulting, particularly, Maori culture, but also the associated Christian beliefs about celebrations of key events in the life of Christ. Fitzsimons' comments on use of metaphor to capture interest were daft, Day's old saw accusing Pakeha of cultural misunderstanding, missed the point, and both Sparrow and Calvi-Freeman ducked for cover. Common sense did not exist. While there is an excellent case for the protection of Maori culture, the definition of culture should not be in the framework of biculturalism from the past, but multiculturalism in the 21st century. Voters are likely to recognise this. Your World Watch correspondent Gwynne Dyer (Monday, March 25) is incorrect when he states that The Treaty of Waitangi was written in both languages (Maori and English). In fact The Treaty of Waitangi was only ever written in the Maori language. Governor Hobson was adamant the Treaty document in Maori signed at Waitangi on February 6 was the de facto treaty document. He subsequently gave specific instructions that all treaty negotiations would be undertaken in the Maori language using a copy of that Maori language treaty document. And that is in fact what happened (including at the Manukau and Port Waikato Treaty signings). All of the so-called English versions of the Treaty are derived from documents purported to be the draft documents crafted by Busby, Freeman, Hobson and others to generate the final English draft of the Treaty handed to Henry Williams on February 4 to translate into the Maori language . . . or they are translations of Te Tiriti o Waitangi in the Maori language written by various authors subsequent to the signing of the Treaty. There is no English version of The Treaty of Waitangi. The Crusaders' name change marks a victory for the Marxist Left, the pseudo-liberals, the Muslim Jihadists and the historically-illiterate revisionists. The ignorance of history, that is a major cause of this regression, should come as no surprise to the population, as both political parties have suppressed the nation's history since the 1970s and exacerbated the situation by permitting dramatic revisions to our national statutes, even the Treaty, without any historical knowledge of them or consideration of future ramifications. This ignorance of our nation's history is so prevalent that we have a prime minister, presently lauded internationally and with suggestions of a Nobel prize nomination, who did not know the wording of the Treaty of Waitangi. History records that the Muslim Jihadists began invading Europe in the eighth century and their mission of converting all to Islam continues to this day. Whilst I wholeheartedly agree with the sentiments expressed by Lana Hart (It's time to get practical about ending racism, April 8), I don't think we are in a very strong position to preach anti-racism whilst we have government-imposed, and encouraged, racism within our systems. We have race-based seats in Parliament, we have places at medical school allocated by race, we have employment opportunities within the public service decided according to race. We even have a racially selected rugby team representing our country. Let's tackle racism by all means, but let's get our own house in order first. In your article (April 4) “Debate on street names called for” you can add to the list some street names referencing the Battle of Gate Pa , Puhirake Cres, Pyes Pa (The Lakes). The Ngai Te Rangi chief Rawiri Puhirake instigated the Tauranga battles by challenging the British to come and fight him. He even built a road so that Greer’s soldiers would not be too tired when they got there. On receiving no reply he moved his pa closer on the lower Wairoa River. When the British still didn’t take up the challenge he moved to Pukehinahina (Gate Pa) where he got his wish. Puhirake and his men repulsed the first attack but knowing their position was so compromised they would not survive the attack which would come in the morning they evacuated the pa under the cover of darkness. Puhirake died at the next battle at Te Ranga which was a major defeat for Maori. Puhirake was widely admired for bravery and is buried in the Mission Cemetery. I wonder if Tommy Wilson and his followers want Puhirake Cres expunged or it only the street names of British soldiers? While the Treaty of Waitangi gave tangata Maori 'The same rights as the people of England if they gave up their kawanatanga/governments to the Queen,' it did not make New Zealand into a British colony under one flag, one government and one law. On May 3, 1841, Queen Victoria's Royal Charter/Letters Patent dated November 16, 1840, separated New Zealand from New South Wales dependency and New Zealand became an independent British colony. This document was our true founding document and first constitution. As Maori celebrate the Treaty of Waitangi on February 6, all New Zealanders must celebrate New Zealand's Independence Day on May 3 every year. It is the day we became one nation under one flag, one government and one law. It's time to shout it from the roof tops. Don't let another year go by without celebrating. It's only one month away. The ignorance of history, that is a major cause of this regression, should come as no surprise to the population, as both political parties have suppressed the nation's history since the 1970s, and exacerbated the situation by permitting dramatic revisions to our national statutes, even the Treaty, without any historical knowledge of them or consideration of future ramifications. History records that the Muslim Jihadists began invading Europe in the 8th Century, and their violent mission of converting all to Islam continues to this day. Very interested to read that the NZ First party opposed the introduction of an act of Parliament that would have given South Island iwi Nga¯ i Tahu exclusive rights to have two appointments made to Environment Canterbury. NZ First spokesman Shane Jones claimed such appointments would have been an ‘‘affront to democracy’’. We know that throughout our country a number of local bodies are considering similar exclusive right appointments and their national organisation, Local Government NZ, seems to be condoning such undemocratic moves. My question is simply this. Will NZ First as the critical Government coalition partner now be taking steps to ensure local government legislation is amended so that no action can be taken at local government level that is an ‘‘affront to democracy’’? We will watch that space with interest. I read Hinemoa Elder’s article regarding the Christchurch terror attacks several times to make sure I understood her intent (‘‘We must not ignore cultural differences’’, Focus). I live in Christchurch and in the time immediately after the terror attacks, I have noticed small but discernible acts of love and kindness. The majority of our community, regardless of race or religion, have supported each other and the families of the victims. Why, then, did Elder admonish just Pakeha for getting in the way? Why not mention Asians, Pacific Islanders, Irish immigrants, South African immigrants, Hindu immigrants, gang members, Christian church groups? All of these groups have offered help and open kindness. My only answer is that her comments were racially motivated and deliberately divisive. We, the people who actually live in Christchurch, have had more than our share of grief. I know from talking to friends and colleagues of all races and religious beliefs that we want to build a more inclusive community where we all have a valuable contribution to make. By the way, I’m a born and bred Aucklander. I love my home town but I deeply respect Christchurch! Councillor Jacoby Poulain says a public poll would not have supported the Hastings District Council proposal to appoint four Maori representatives to their four standing committees “because only 20 per cent of the population is Maori”. That may well have been the case, but at least a poll is democratic. And democracy is how councillor Poulain got elected. Yes, Winston Churchill once said democracy was the worst form of government “except for all the others”. What does that say about “the others?” They are infinitely worse. I am sorry Tariana Turia feels the way she does about assisted dying. In the Horizon Research Poll, May 2017, Maori were 71 per cent in favour of assistance to die being available in terminal illness as per the End of Life Choice Bill. If a Maori person accesses assistance to die they will be able to respect their cultural values better than in many usual end of life situations. Before the assistance takes place they will be able to discuss with whanau and come to a consensus view of whether they should ask for assistance to die. They are encouraged to talk with family. Obviously, the person concerned has to make the final request. If the patient wants it, the health practitioners concerned will talk to family. The person will be competent and awake when it happens, with family around them in support. Family will have immediate and continuing access to the patient afterwards. The disabled or old are not eligible unless they meet the criteria of terminal illness, major irremediable unbearable suffering, and be in an advanced stage of incapacity. It is intended that the body who provide the second doctor will have cultural representation. This may surprise you Tauranga City councillors say you are continually being consulted about proposals. The local body law states that all citizens must be consulted on plans and proposals that affect them. All of us know this is not happening and consequently, the TCC is not obeying the law. I believe, many things are being actioned which would never be agreed to, if there was proper consultation operational. Like the free gifting of a residential property. in Mission St. to a tribal (rust. Effective consultation of our community and action as directed must be done. as the law demands. I was wondering, when our Prime Minister proclaims "We are one people," is she meaning the way immigrants and refugees, such as Muslims, assimilate into New Zealand society, accepting our traditions and values? Or is she referring to the relationship of part-Maori and non-Maori? If she's meaning that New Zealand's part-Maori and non-Maori are one people, why did Donald Brash get "de-platformed" at Massey University for saying and, in fact, preaching that? A fine example in New Zealand since Hobson assured Bishop Pompallier at Waitangi is our religious tolerance — the persecution of Jews and the brutal conflicts of Catholic/Protestant or Christian/Muslim have been absent from ow shores. Of course, on rare occasiors when a religious group has chosen to defy social norms and the law of the land, vigorous steps have been necessary to deal with it. The nasty cults of Parihaka and Rua Kenana, who stated his seditious position in the middle of a major war, are among the few examples. And in those cases, the authorities' response was fair and moderate. So now, in the aftermath of the appalling tragedy in Christchurch, it surely comes as a considerable shock to find ourselves berated by prominent figures, of whom Person of the Year Anne Salmond would be one, telling us that we are "white supremacists" who belittle others with of ridicule, suppression and contempt. And many others are using distorted accounts of our recent colonial past to use this situation to advance their political position and bid for more power. As an 88-year-old pensioner of the group frequently vilified by some ethnic and pseudo-liberal groups as male, pale and stale, the only 'white privilege' that I have experienced in a working life engaged in naval service, teaching, an abundance of other jabs and raising five children, has been to be dully employed the whole time and so able to provide the taxes needed to support those less fortunate. Democracy and free speech is alive in Hamilton with one councillor happy to fly in the face of good science, medicine, sound history and sheer common sense. Cr Henry showed poor taste at the weekend when she defiantly wore an "Anti Vaxx" shirt at a time when NZ may be facing a measles epidemic. I suspect few parents in Christchurch would applaud her. She also opposes fluoridated water supply despite the opinions of almost all doctors and dentists. I was born and grew up in Hamilton pre fluoride and by the time I was twenty had acquired the usual mouth full of fillings. Since 1967 my wife and I have always lived with fluoridated water and neither of us have had new fillings since about 1975. Our two daughters, in their forties, and four grandchildren are today filling free. Good enough proof for me. Cr Henry also knows little of history if she equates Gov, Sir George Grey in the same light as Hitler. Five minutes of research would show her that Grey was the best friend Maori ever had. During his first term he was lauded by them and nowhere more so than at Rangiaowhia. He was brought back to serve a second term precisely because of his rapport with Maori. It is shocking that Hastings District Council feels able to abandon democracy and appoint totally unelected Maori to council committees. With 25 per cent of Hastings’ population being Maori, there is surely no reason why Maori cannot be elected to the HDC. Already four of the 14 elected members have Maori heritage. It is an insult to the ratepayers of Hastings that the council has made this decision to appoint those who have not stood before the ratepayers to seek their endorsement. This is a very slippery slope for democracy. The issue will not go away, and will no doubt be remembered when the local body elections take place later in the year. At the very time the prime minister is stressing the fact that all New Zealanders should have equal rights, and that we should be one people, Hastings District Council votes to give voting rights to some citizens on purely racial grounds. Time for a change, I think, because this has been a disgraceful example of what not to do in local government. It is shocking that the Hastings District Council feels able to abandon democracy and appoint totally unelected Maori to council committees. With 25 per cent of Hastings population Maori, there is surely no reason why Maori cannot be elected to the HDC. Four of the 14 elected members have Maori heritage. At the very time the Prime Minister is stressing that all New Zealanders should have equal rights, and we should be one people, the Hastings District Council votes to give voting rights to some citizens on purely racial grounds. As an 88-year-old pensioner of the group frequently vilified by some ethnic and pseudo-liberal groups as: 'Male. Pale and Stale'. the only "White Privilege" that I experienced in a working life engaged in naval service, teaching an abundance of other jobs and raising five children, has been to be fully employed the whole time and so able to provide the taxes needed to support those less fortunate.